In the spring of 1997, two rural Tennessee addicts find themselves under investigation for dealing crystal meth. Together, they concoct an ill-conceived plan to outrun the law, letting nothing stand in their way. Murder, insurance fraud and switched identities are only the beginning of a cat and mouse mystery that leaves an unidentified murder victim in their wake. As the case goes unsolved, Dr. Chris Walsh, Chief Forensics Odontologist of the Tennessee Medical Examiners office sets his sights on identifying the nameless victim and solving the gruesome crime. Fact and fiction collide in this intricate and chilling story by first time author Dr. Mike Tabor. Culled from real case history, Tabor leads the reader on a journey that takes them from the world famous Body Farm in Knoxville, TN to the site of World Trade Center terror attacks and the identification of nearly 1000 victims. 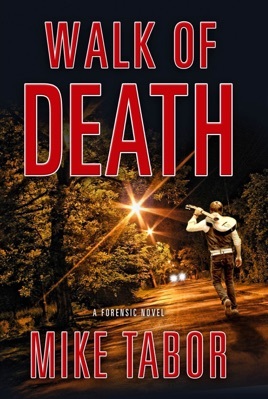 Intrigue, drama and edge-of-your-seat suspense help make Walk of Death an exciting and frightening read that rivals some of the best crime dramas ever published.